The most likely situations that could cause the low speed buffet would be when an airplane is flown at too slow of a speed for its weight and altitude causing a high AOA. This very high AOA would have the same effect of increasing airflow over the upper surface of the wing to the point that all of the same effects of the shock waves and buffet would occur as in the high speed buffet situation. High altitudes—The higher the airplane flies, the thinner the air and the greater the AOA required to produce the lift needed to maintain level flight. Heavy weights—The heavier the airplane, the greater the lift required of the wing, and all other things being equal, the greater the AOA. “G” loading—An increase in the “G” loading of the wing results in the same situation as increasing the weight of the airplane. It makes no difference whether the increase in “G” forces is caused by a turn, rough control usage, or turbulence. The effect of increasing the wing’s AOA is the same. An airplane’s indicated airspeed decreases in relation to true airspeed as altitude increases. As the indicated airspeed decreases with altitude, it progressively merges with the low speed buffet boundary where pre-stall buffet occurs for the airplane at a load factor of 1.0 G. The point where the high speed Mach indicated airspeed and low speed buffet boundary indicated airspeed merge is the airplane’s absolute or aerodynamic ceiling. This is where if an airplane flew any slower it would exceed its stalling AOA and experience low speed buffet. Additionally, if it flew any faster it would exceed MMO, potentially leading to high speed buffet. This critical area of the airplane’s flight envelope is known as “coffin corner.” All airplanes are equipped with some form of stall warning system. Crews must be aware of systems installed on their airplanes (stick pushers, stick shakers, audio alarms, etc.) and their intended function. In a high altitude environment, airplane buffet is sometimes the initial indicator of problems. Mach buffet occurs as a result of supersonic airflow on the wing. Stall buffet occurs at angles of attack that produce airflow disturbances (burbling) over the upper surface of the wing which decreases lift. 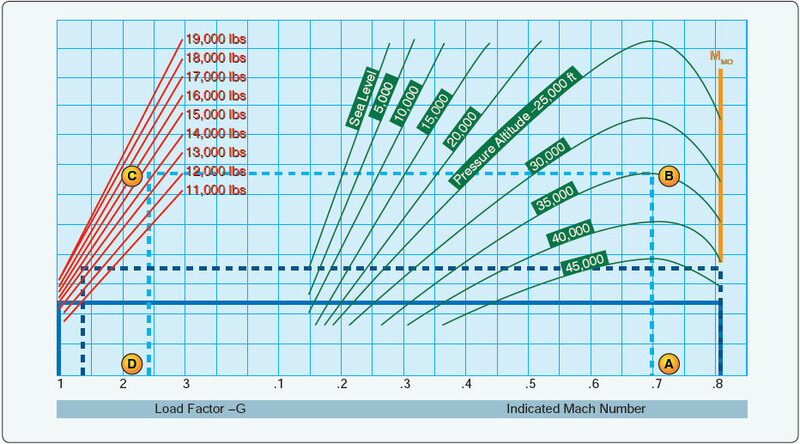 As density altitude increases, the AOA that is required to produce an airflow disturbance over the top of the wing is reduced until the density altitude is reached where Mach buffet and stall buffet converge (coffin corner). When this phenomenon is encountered, serious consequences may result causing loss of airplane control. The transitioning pilot must bear in mind that the maneuverability of the jet airplane is particularly critical, especially at the high altitudes. Some jet airplanes have a narrow span between the high and low speed buffets. One airspeed that the pilot should have firmly fixed in memory is the manufacturer’s recommended gust penetration speed for the particular make and model airplane. This speed is normally the speed that would give the greatest margin between the high and low speed buffets, and may be considerably higher than design maneuvering speed (VA). This means that, unlike piston airplanes, there are times when a jet airplane should be flown in excess of VA during encounters with turbulence. Pilots operating airplanes at high speeds must be adequately trained to operate them safely. This training cannot be complete until pilots are thoroughly educated in the critical aspects of the aerodynamic factors pertinent to Mach flight at high altitudes.